Belstaff is delighted to announce its new footwear collaboration with Tricker’s, one of the longest established shoemakers in England. Founded in 1829, Tricker’s is known for its durable, high quality leather footwear, which is still manufactured and finished by hand in Northampton. 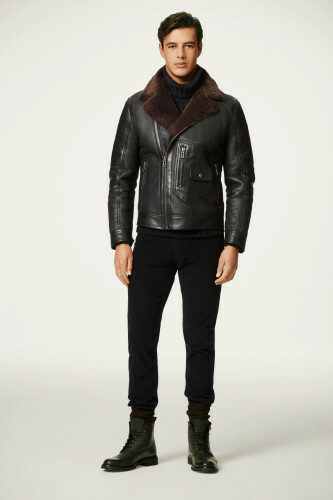 Belstaff, founded in 1924, also has a long history of working with hand-waxed leather, producing highly durable products. The collaboration between these two iconic British heritage brands showcases the very best of British craftsmanship. Belstaff and Tricker’s both combine functionality with long lasting quality. The collaboration features the ‘Phoenix’ boot and shoe, both featuring a modern twist on the classic brogue, each available in very limited quantities. The ‘Phoenix’ black leather fabric features the classic Tricker’s needlework detail to ensure the design stands out. Every pair of Tricker’s is the result of 260 individual processes carried out by master shoemakers. The classic English country brogue boot has added gearshift patch reinforcement across the toe, to give protection to the wearer. The signature Belstaff dark iron knurled roller bar buckle allows for size readjustments. The commando rubber lug sole with Goodyear welt construction is built to withstand all weather conditions. Available in a limited edition run of 50 pairs only. The ‘Phoenix’ shoe is of the same classic needlework design, with leather lace detailing, available in a limited edition run of solely 30 pairs. The double-stacked leather sole has an added Tricker’s layer of cork, which molds to the wearer’s foot, providing insulation and comfort. All footwear is waxed meticulously to ensure its waterproof quality. The collaboration goes on sale in Belstaff stores and online from Tuesday 29th November until the limited stocks run out. Belstaff is a modern British heritage brand steeped in the spirit of adventure, protecting independent spirits to venture free. In Belstaff, the fearless explorer and the stylish alike will discover clothing for a contemporary lifestyle influenced by Belstaff’s rich 92 year history, yet firmly rooted in the present and forever forward-looking.